Witch Hunt It Happened in Salem Village - 1989 publication. Illus. in full color. 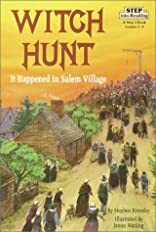 "Krensky ably retells the story of 1692 Salem witch trials, making clear the unfairness of the trials that led to the executions of 19 supposed witches. Color drawings add atmosphere. A good choice for a simple introduction to the ever-popular story of witchcraft in 17th century Salem." --School Library Journal.